The FAO-LinKS project (Gender, biodiversity and local knowledge systems for food security) sponsored two studies, in Southern Highlands and Central Tanzania, on local knowledge in relation to management of agrobiodiversity for food security. 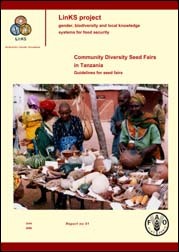 Following the studies, four community diversity seed fairs were held in 2005. The research teams worked closely together with the rural communities in organizing these seed fairs and field testing the guidelines. These guidelines were developed in collaboration with the FAO Gender and Population Division and the Seed and Plant Genetic Resources Service.